A middle school student in Wisconsin tests his new game. Games have shown great promise for learning, but it’s not always easy to figure out the logistics of how to use them in class. Every student and teacher’s experience is unique and it takes time to calibrate and tinker to get the best out of the experience. What's more, using games might lead to something neither students or teacher anticipated -- more work. When it came to using the game Operation Lapis to learn Latin, the experience proved to be a mixed bag for students and teachers. In the game, students play the role of Romans in a reconstruction of ancient Pompeii (or ancient Rome) and have to learn to think, act, create and write like a Roman in order to win the game. Those are the same goals of any introductory Latin course. After Kevin Ballestrini launched the game in his own class, ten other interested teachers decided to take a stab at using it in their classes. The prevailing conclusion? Students’ successes represent the environment and instructor as much as the game itself. The teachers shared similar joys and frustrations with the challenges, whether it was an over-designed aspect of the game or the benefit of creating active learners. And without exception, they all said they spent more time reviewing students’ writing and were impeded by lack of technology access in the classroom. Karen Zook, a Ph.D. student working under professor Roger Travis, one of the co-creators of the game, says students struggled with the new game when she first started using it in her college Latin class. "The game provides an insurmountable problem because they cannot simply skid by not doing anything." Students were also skeptical when they learned their homework was going to take the form of a game. After that initial adjustment period, though, they came to appreciate Lapis, she said. “It forces engagement, and provides for a less-frustrating classroom experience, since it compels students to prepare for class in a way that’s [different] in a more traditional setting," she said. This "forcing" of student engagement was a common thread among teachers who tried the game. "There are a portion of students who refused to buy into the system and they have since failed out of the class," said Matthew Bennet, a high school Latin teacher and co-creator of the game. "The issue with those particular students is that [the game] requires students to take an active role in learning, rather than passively allow them to have the learning done to them. So, for students who do not do any sort of work, Lapis provides an insurmountable problem because they cannot simply skid by not doing anything. Lapis is constructed in such a way that not doing anything is impossible." The students weren’t the only ones adjusting to this type of class. Most teachers also found using the game to require a more active role than traditional classes. Matt Ramsby, who started using Lapis in January, enjoys the experience overall but says he’s spending much more time on this class than in other Latin classes he’s taught. "The biggest downside I've found so far is the amount of time it takes me to check on their daily inputs into the interface, which I find tedious and sometimes difficult to manage,” Ramsby said. As a result, he hasn’t used several key parts of the program, like the cards, the LPs, for instance, because he hasn’t had time. Bennet agrees. "It takes a tremendous amount of time and energy as a teacher to keep up with 60 students writing so much Latin 3 times a week," he said. Clearly, there are positive and negative effects of the rigor of the course. Ballestrini said it took him similar amounts of time as the other teachers, but he spent it monitoring students' progress rather than grading homework after it was turned in. But not everyone has that time in the evening to spend, Zook points out. Especially at the college level when students might be working at less traditional times, like pounding out a paper at 4 a.m.
"To be honest, I am probably the limiting factor in my students' enjoyment and full appreciation of it." All except for one teacher interviewed who implemented the game said students learned as much as a normal class, or more. The one teacher who stopped using the game within the first few weeks claimed his students started out with more knowledge than the game anticipated. Other teachers simply skipped some sections of it. 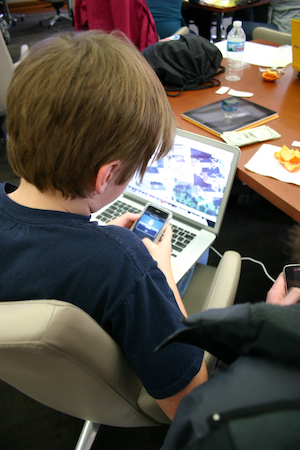 As game-based learning becomes more common, best practices and techniques will continue to develop. Perhaps a year from now each of these teachers will know exactly how to best implement Lapis in their courses and be singing its praises. Ramsby is still very hopeful. "I think it the game represents a legitimate alternative to traditional curriculum models in the teaching of Latin,” he says. “I'm not really finding much success with it yet in that sense, since I'm using with students who've already had at least one year of Latin, so most of the material seems basic to them. But I like the idea, and I like it a lot, of having an electronic role-playing textbook such as this. And to be honest, I am probably the limiting factor in my students' enjoyment and full appreciation of it."